Hurry here to print a new $2/1 any Gerber Graduates Sippy Cup coupon. 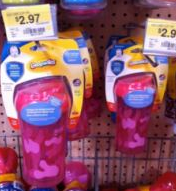 Then use this coupon at Walmart to score some cheap sippy cups – you can never have enough of these! Final cost = ONLY $0.97! This is a manufacturers coupon that can be used anywhere.